Boston Marathon 2016 Results: Ethiopian Runners Shut Kenyans Out Of Top Spots : The Two-Way Runners from Kenya, who had for years been considered the best of the best in the world, were nearly shut out from the podium entirely. 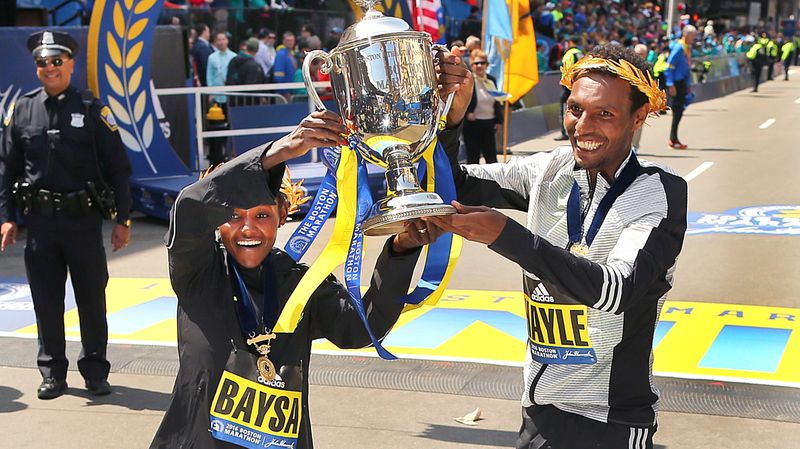 Boston Marathon women's winner Atsede Baysa and men's winner Lemi Berhanu Hayle, led a dominant group of Ethiopian runners in Monday's race. Two Ethiopian runners wore the golden laurels denoting winners of the Boston Marathon Monday, marking the first time in the race's 120 years that Ethiopian racers won both the men's and women's divisions. For the men, it was newcomer Lemi Berhanu Hayle, 21; for the women, it was Atsede Baysa, 29, whose career includes wins in Paris and Chicago. Runners from Kenya, who had for years been considered the best of the best in the world, were nearly shut out of the podium entirely. As the AP reports, "Joyce Chepkirui was third in the women's race, the lone Kenyan to medal in a race that had been dominated by her countrymen for decades." "21-year-old Lemi Berhanu Hayle did a little skip-jump as he took the men's race at 2 hours, 12 minutes, 45 seconds. He beat defending champion Lelisa Desisa. "On the women's side, Atsede Baysa, 29, crossed the finish line in an unofficial time of 2:29:19. She got a hug from her coach on the other side and sent up a quick prayer of thanks. Baysa had been almost 40 seconds behind just a few miles back, but she made up the time to take the lead, and then some. Defending women's champion Caroline Rotich dropped out in the first 5 miles. "Also running in the race this year: two survivors of the 2013 bombing who each lost a leg in the blast, Adriana Haslett and Patrick Downes." The men's wheelchair race provided the closest finish of the day, with Marcel Hug of Switzerland breaking the tape at the 1:24:06 mark – just ahead of Ernst Van Dyk of South Africa (second) and Kurt Fearnley of Australia, who were nose-and-nose in Hug's wake. Tatyana McFadden of the U.S. won the women's wheelchair race, earning her fourth consecutive victory in Boston with a time of 1:42:16. Like many runners in today's race, McFadden competed in honor of Martin Richard, who was eight years old when he was killed in the 2013 attacks. On social media and at the race, runners showed their support for the Martin Richard Foundation (goal: to invest in education, athletics, and community) by using the hashtag MR8 — the boy's initials and his sports number. Dozens of athletes wore jerseys featuring MR8 today.